Social media, web analytics, marketing, sales, support, infrastructure... monitor everything! Pull data from popular services like Google and Salesforce using pre-built widgets. Monitor individual departments, multiple websites and anything else using dashboards. Click each dashboard to view example. Track number of new sign ups, app downloads, subscriptions, and other related KPIs in real-time. Monitor brand mentions, track number of Twitter followers over time, view Facebook demographics, and more. Monitor all your marketing channels like email, SEO, SEM, social media, and analytics from one place. Automate client reporting by bringing together their advertising, SEO, social media, and analytics data. Track multiple websites, top referring domains, search engines, SEO keyword rankings, and more. Keep tabs on business expenses, company revenue, customer invoices, balances, and more. View sales goals, top sales reps, latest opportunities, win/loss reports, new customers, and more. Get a bird's eye view of your latest projects, tasks, to-dos, upcoming calendar events, and more. Network monitoring, website uptime, server load, app performance, and end-user tracking all in one place. Monitor individual departments, multiple websites and anything else using dashboards. Securely display data from your company's databases using custom widgets or Push API. Share dashboards with management, customers and virtually anybody else. Download or schedule email reports of your data in PNG, JPEG, PDF, and CSV formats. Data from the past is archived within Cyfe, so you will never lose sight of it again. Automatically rotate one or more dashboards for your big screen monitor. Branded reports, domain name mapping, dashboard backgrounds, and more. Plan, schedule and manage your social media campaigns across major social networks. Slice and dice unrelated metrics from completely different apps to create brand new insights. Monitor metrics even when you're away from your dashboards via email or SMS. Benchmark metrics against your business objectives to identify areas of improvement. Just signed up for Cyfe & loving it! I can't recommend Cyfe strongly enough - the best integrated business/media dashboard going around. Love Cyfe - looks gorgeous & useful for monitoring loads of stuff! 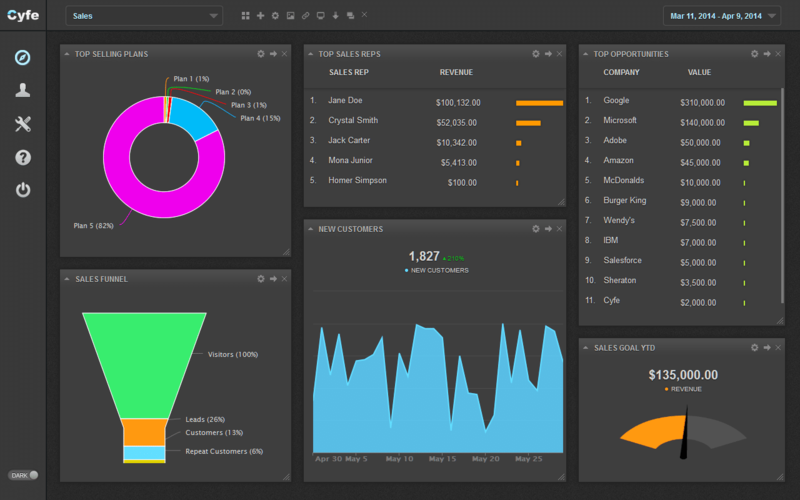 Amazing Cyfe, great dashboard to monitor web services (impressive analytics + adsense + social mix). The user experience of the Cyfe monitoring tool is great! I bet even my dad will learn to use it.. thx! Cyfe is one hell of a nice monitoring dashboard tool! Great service that helps small businesses keep track of social media and marketing tools.